If you love cake decorating and prefer to eat frosting with a spoon, you’ve come to the right place. Take your passion for baking to the next level with these fun and fabulous cake costume ideas. Decorate your costume with luscious buttercream that won’t melt on you. So, bake up your most delicious homemade costume for the most irresistible Halloween costume. 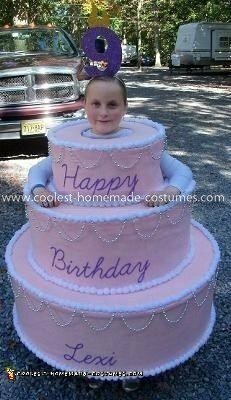 What’s better than a wedding cake costume? 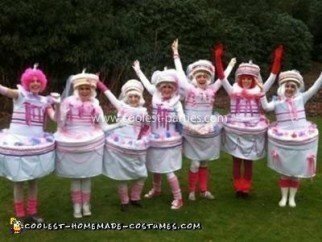 This group of wedding cake costumes! Check out the materials you need to put this group costume together. When punk rock meets frosting, DIY costume magic happens. Check out how LoriAnn created her homemade costume here. Take a look at this crazy impressive wedding cake costume made from the humblest of materials, i.e. coffee filters! Find out how Michelle made this epic creation, here. This awesome homemade costume took 7 hours to complete and was actually comfortable! 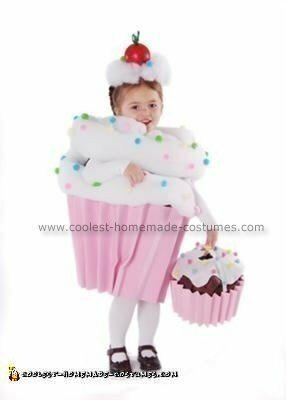 When your nickname is “little cupcake” you pretty much know what your Halloween costume will be. Check out the instructions to make this adorable homemade costume. 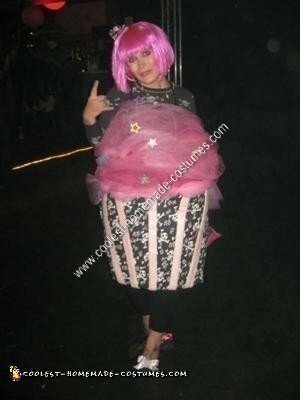 For a more grown up cupcake costume, take a look at Caitlin’s pink frosted ensemble. Can’t commit to a whole cake? 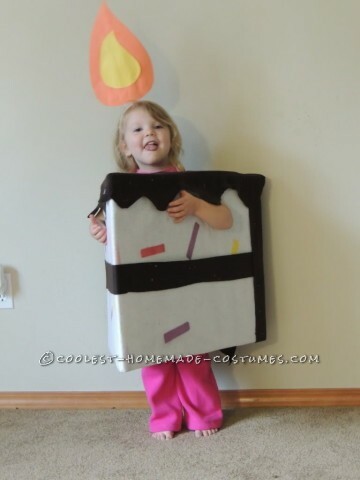 This adorable cake slice costume was made using a cardboard box and some felt. Try out Rebecca’s DIY costume tutorial which can work for any age. 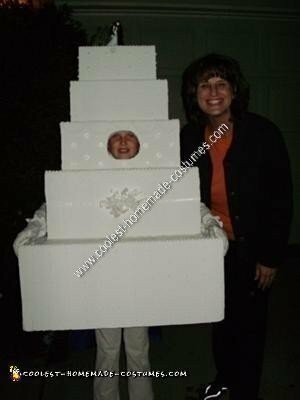 Fill a piping bag with drywall and have a blast decorating a wedding cake costume. Read how Joy and her daughter did just that to create this incredible homemade costume. 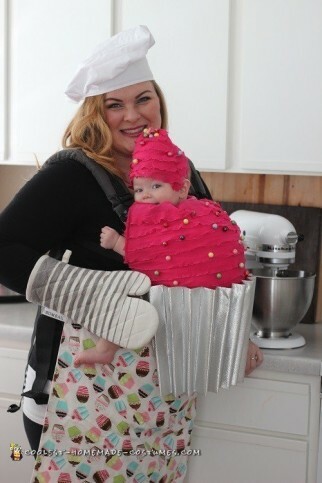 Krysta is known for baking yummy cupcakes, but this babywearing costume is definitely the sweetest cupcake she’s ever made. Even better, it won a prize for the cutest costume! Another take on the same idea of a cupcake and her baker. 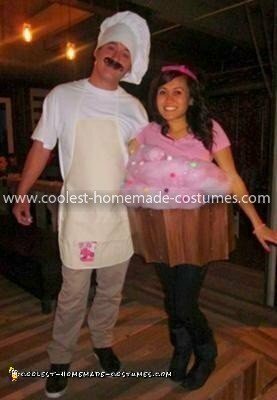 Melissa’s boyfriend asked her to be his girlfriend using edible letters on cupcakes, so they just had to make this homemade cupcake and baker costume! 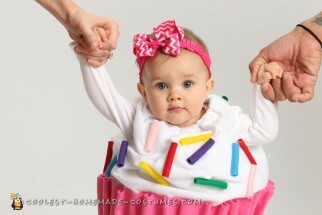 You can never have too many baby cupcake costumes on one list! We just couldn’t leave out one of the most popular homemade costumes on our site. Check out even more cake inspiration from our friends over at the Coolest Cakes site. So, are you ready to whip up a sweet treat for your Halloween costume? 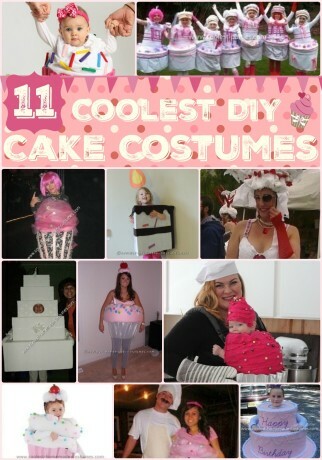 We can’t wait to see your DIY costume confection here!